Although, we classify as intravascular and extravascular hemolysis, “diseases” don’t read the book. These disorders may be described as causing extravascular hemolysis, but your case may be the uncommon exception with intravascular hemolysis that was not mentioned. Diseases may cause anemia by both intravascular and extravascular hemolysis. Extravascular hemolysis typically accompanies intravascular hemolysis. Disorders may also switch from one to another. What happens when haptoglobin is depleted Free heme binds to hemopexin or Hemoglobin is oxidized to Methemoglobin. Sickling test (2% metabisulfite or dithionite) Negative Sickling in Sickle cell anemia. NESTROF Test (0.35% NS added to control and patient’s blood sample) Screening test for Beta-thalassemia trait – black line in white paper placed behind the patient’s tube is not visible (resistant to hemolysis). Intravascular volume is intact and the clinical signs and symptoms are directly related to anemia. RBC life span is chronically shortened, but bone marrow compensation prevents anemia. Dramatic acute hemolytic event occurs when the cells are challenged with oxidizing agents. No features of chronic hemolysis like gall stones and splenomegaly. Chronic onset with extramedullary hematopoiesis inadequate to compensate severe anemia. 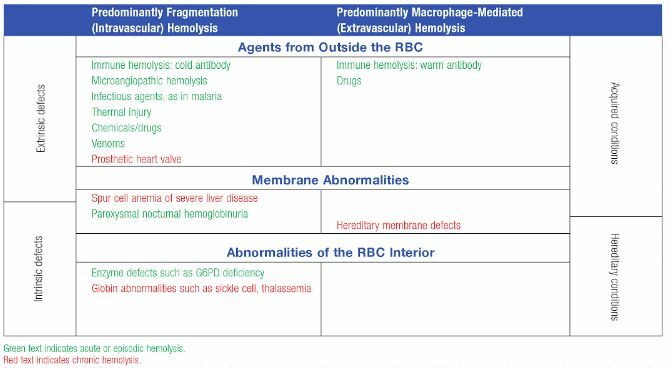 Example: Extravascular hemolysis in RBC membrane defects, Thalassemia, etc. Hereditary Spherocytosis: Spectrin binds to Ion transporters in cell membrane Band 3 in head region and Glycophorin A in tail region with the help of Band 4.2 + Ankyrin and Band 4.1 + Actin respectively. Mutation in these proteins lead to Hereditary spherocytosis. Hereditary Elliptocytosis: Commonset cause is mutation in spectrin. G6PD deficiency: G6PD is required to produce NADPH which inturn is needed to produce Reduced Glutathione (GSH) required to convert hydrogen peroxide to water. Hence, oxidative stress (free radical release by leukocytes in infection, fava beans, antimalarials, sulfonamides, nitrofurantoin, etc.) in GSH deficient state leads to hemolysis. Also, denatured globin forms membrane-bound precipitaes known as Heinz bodies capable of inducing both intravascular and extravascular hemolysis. Episodes are self-limited because only old RBCs are lysed. Acidotic states like exercise (increased lactic acid) or sleep (decreased respiratory rate and carbondioxide washout) activates complement system. Activate complement resulting in opsonization and extravascular hemolysis of RBCs. Cold Hemolysin AIHA: IgG (Donath-Landsteiner antibodies) directed against P antigen present on RBCs lead to intravascular hemolysis. Sickle cell anemia: Point mutation that causes the glutamic acid to be replaced by valine at the beta-6 position of the globin chain. Increased HbS concentration = Increased sickling i.e. more severe in homozygous disease. HbA (in heterozygotes), HbC (lysine replaces glutamate at beta-6 position of globin chain) and HbF (newborn till 6 months and hydroxyurea) have inhibitory effect on disease. Increased MCHC = Increased sickling i.e. intracellular dehydration increases MCHC and sickling; thalassemia decreases MCHC and sickling. Acidosis shifts the Oxygen-Hemoglobin dissociation curve to right, increasing deoxygenated hemoglobin and hence, sickling. Beta-thalassemia: Mutation (most common – splicing mutation) in chromosome 11 results in defective beta-globin synthesis. Alpha-thalassemia: Gene deletion in chromosome 16 results in defective alpha-globin synthesis. Alpha-globin synthesis defective but normal beta-globin and gamma-globin synthesis. Next Next post: Ascitic Fluid Analysis : How to come to diagnosis?